Three of the ten top dividend Technology WallStars by yield (shaded in the chart above) were verified as being among the top ten gainers for the coming year based on analyst 1 year target prices. 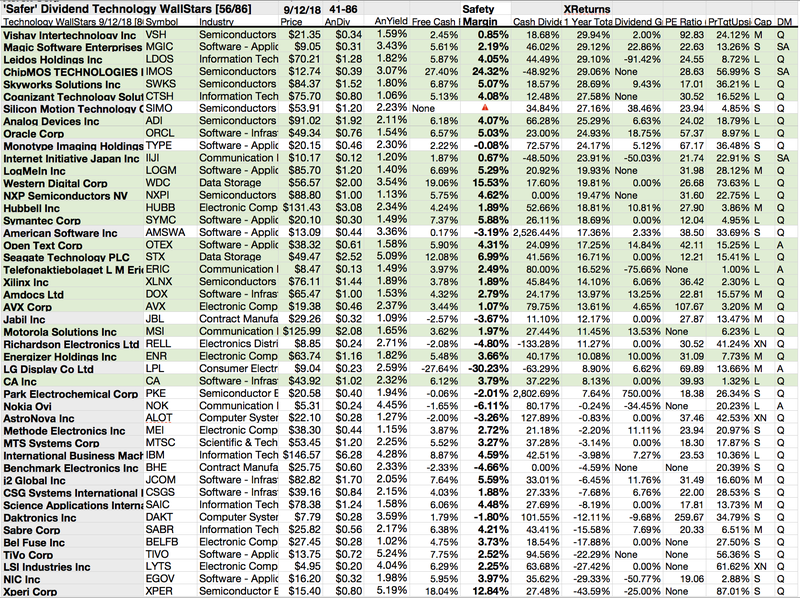 Thus the dog strategy for this Technology WallStar list as graded by analyst estimates for this month proved 30% accurate. Western Digital (WDC) netted $751.26 based on estimates from thirty-one analysts, plus dividends less broker fees. The Beta number showed this estimate subject to volatility 11% less than the market as a whole. Applied Materials (AMAT) netted $602.82 based on the median of estimates from twenty-five analysts, plus dividends, less broker fees. The Beta number showed this estimate subject to volatility 53% more than the market as a whole. Lam Research (LRCX) netted $563.43 based on dividends plus a median target price estimate from twenty-one analysts less broker fees. The Beta number showed this estimate subject to volatility 33% more than the market as a whole. Kulicke Soffa Industries (KLIC) netted $367.27, based on dividend, plus a median target price estimate from three analysts, less broker fees. The Beta number showed this estimate subject to volatility 17% more than the market as a whole. Microchip Technology Inc (MCHP) netted $366.80 based on a median target price set by nineteen analysts plus estimated dividends less broker fees. The Beta number showed this estimate subject to volatility 9% more than the market as a whole. Skyworks Solutions Inc (SWKS) netted $359.97 based on estimates from twenty-eight analysts plus dividends less broker fees. The Beta number showed this estimate subject to volatility 43% less than the market as a whole. Cypress Semiconductor (CY) netted $328.14 based on mean target price estimates from sixteen analysts plus dividends less broker fees. The Beta number showed this estimate subject to volatility 98% more than the market as a whole. Broadcom (AVGO) netted $264.96 based on estimates from thirty-three analysts plus dividends less broker fees. The Beta number showed this estimate subject to volatility 7% less than the market as a whole. Intel (INTC) netted $257.54, based on dividend, plus a median target price estimate from thirty-eight analysts, less broker fees. The Beta number showed this estimate subject to volatility 3% more than the market as a whole. TE Connectivity (TEL) netted $243.75 based on a median target price estimate from fifteen analysts, plus projected annual dividend less broker fees. The Beta number showed this estimate subject to volatility 1% more than the market as a whole. Average net gain in dividend and price was 41.06% on $10k invested as $1k in each of these ten Technology WallStar “safer” dividend stocks. This gain estimate was subject to average volatility 27% more than the market as a whole. The “dog” moniker was earned by stocks exhibiting three traits: (1) paying reliable, repeating dividends, (2) their prices fell to where (3) yield (dividend/price) grew higher than their peers. Thus, the highest yielding stocks in any collection became known as “dogs.” More specifically, these are, in fact, best called, “underdogs”. Nineteen industries constitute the Technology sector, and thirteen of those were represented by the 51 WallStar firms whose stocks showed positive annual returns and margins of cash to cover dividends by this screen as of September 12. The industry representation broke-out as follows: Data Storage (2); Semiconductors (17); Software -Application (6); Semiconductor Equipment Materials (6); Communication Equipment (7); Computer Systems (2); Electronic Components (4); Software – Infrastructure (4); Consumer Electronics (1); Information Technology Services (2); Health Information Services (2); Internet Content Information (1); Scientific Technical Instruments (1); Computer Distribution (0); Contract Manufacturers (0); Electronics Distribution (0); Electronic Gaming Multimedia (0); Semiconductor Memory (0); Solar (0). The first four industries listed above populated the top ten Technology ‘safer’ dividend pack by yield. A previous article discussed the attributes of the 50 Top yield and 50 top target gainers on this master list. You see grouped below the tinted list documenting 56 of 86 that passed the Technology dog “safer” check with positive past-year returns and cash flow yield sufficient to cover their anticipated annual dividend yield. The margin of cash excess is shown in the bold face “Safety Margin”column. Financial success, however, is easily manipulated by boards of directors making company policies cancelling or varying the payout of dividends to shareholders. Concerns about cash reserves for emergencies and unintended patent infringement consequences weigh heavy on the technology leaders. This article contends that adequate cash flow is a strong justification for a company to sustain annual dividend increases to shareholders. Four additional columns of financial data, listed after the Safety Margin figures above, reveal payout ratios (lower is better), total annual returns, dividend growth levels, and Price/Earnings ratios for each stock. This data is provided to reach beyond yield to select reliable payout stocks. Total annual returns by positive results narrowed the 86 Technology WallStars list to 69 for this article. Positive results in all five columns after the dividend ratio is remarkable as a solid financial signal. To quantify top dog rankings, analyst mean price target estimates provide a “market sentiment” gauge of upside potential. Added to the simple high yield metric, these analyst mean price target estimates became another tool to dig out bargains. $5000 invested as $1k in each of the five lowest priced stocks in the “safe” ten Technology Sector pack by yield were determined by analyst 1 year targets to deliver 55.43% LESS gain than $5,000 invested as $.5k in all ten. 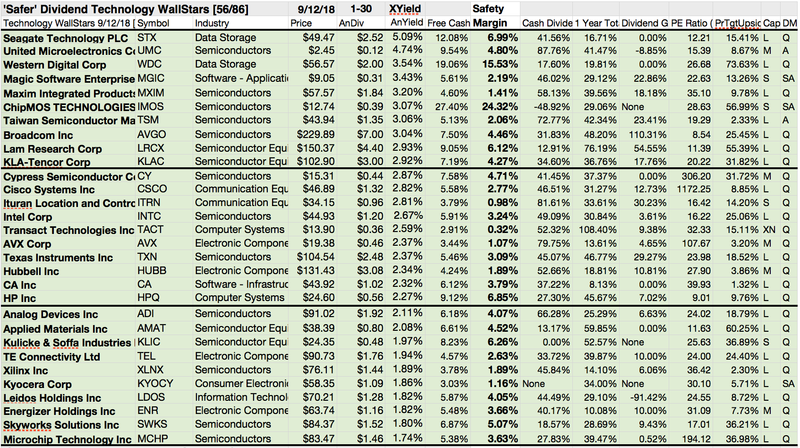 The sixth lowest priced “safer” dividend Technology WallStar, Western Digital (WDC) showed the best analyst augured net gain of 75.13% per their targets. 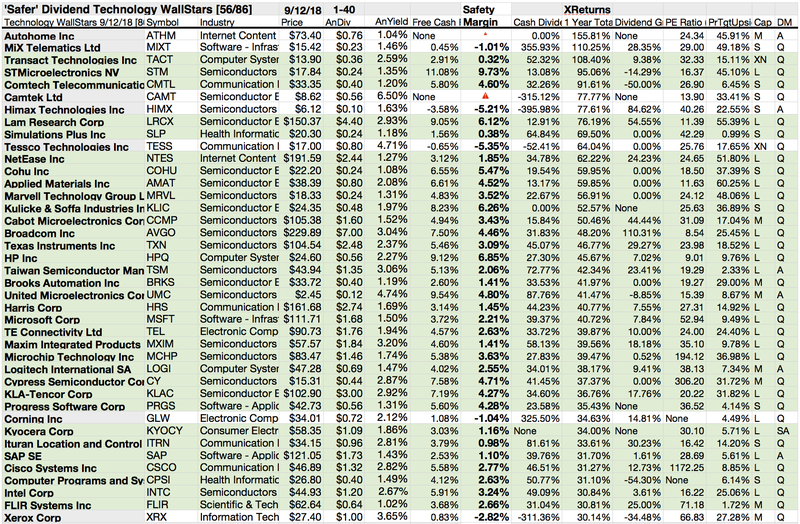 Lowest priced five “safer” Technology WallStars as of September 12 were: United Microelectronics Corp (UMC); Magic Software (MGIC); ChipMOS TECHNOLOGIES Inc (IMOS); Taiwan Semiconductor (TSM); Seagate Technology (STX), with prices ranging from $2.45 to $49.47. 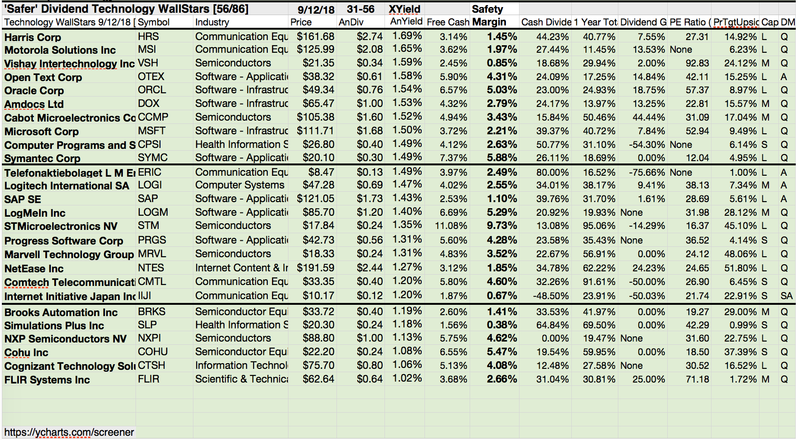 Higher priced five “Safer” Dividend Technology dogs as of May 25 were: Western Digital (WDC); Maxim Integrated Products (MXIM); KLA-Tencor Corp (KLAC); Lam Research Corp (LRCX); Broadcom (AVGO), with prices ranging from $56.57 to $229.89. Big, high priced Technology dogs took charge of the September ‘Safer’ dividend WallStars. This distinction between five low priced dividend dogs and the general field of ten reflects the “basic method” Michael B. O’Higgins employed for beating the Dow. The added scale of projected gains based on analyst targets contributed a unique element of “market sentiment” gauging upside potential. It provided a here and now equivalent of waiting a year to find out what might happen in the market. Its also the work analysts got paid big bucks to do. Caution is advised, however, as analysts are historically 20% to 80% accurate on the direction of change and about 0% to 20% accurate on the degree of the change. The net gain estimates mentioned above did not factor-in any foreign or domestic tax problems resulting from distributions. Consult your tax advisor regarding the source and consequences of “dividends” from any investment. Stocks listed above were suggested only as possible starting points for your safest “Safer” Technology dog dividend stock research process. These were not recommendations. Disclaimer: This article is for informational and educational purposes only and should not be construed to constitute investment advice. Nothing contained herein shall constitute a solicitation, recommendation or endorsement to buy or sell any security. Prices and returns on equities in this article except as noted are listed without consideration of fees, commissions, taxes, penalties, or interest payable due to purchasing, holding, or selling same. Catch The Dog Of The Day on Facebook! At 8:45 AM every NYSE trading day on Facebook/Dividend Dog Catcher, Fredrik Arnold gives a quick live video summary of a potential selection for his new Ivy portfolio. 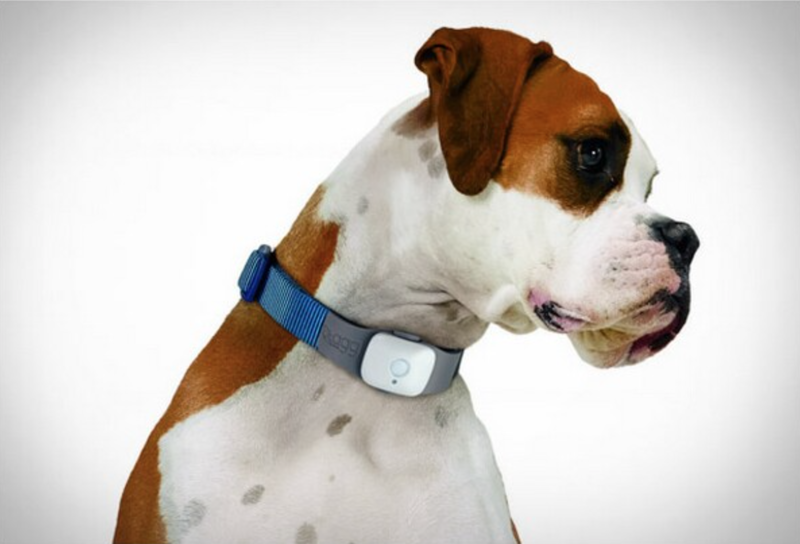 Technology pups qualify as valuable catches! Find them among the 52 Dogs of the Week I, or the 52 Dogs of the Week II now showing full returns. Dogs of the Week III (Safari to Sweet Success) currently accumulating gains. Yes, a new portfolio named Ivy(IV) has launched! Click here to subscribe or get more information. Always remember: Root for the Underdog. Disclosure: I am/we are long CSCO, INTC.